One of the highlights of this year’s book tour was my History of Barbecue lecture at Harvard. 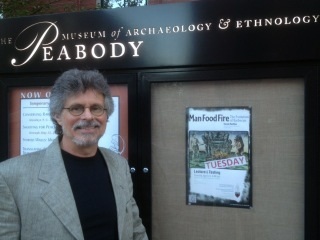 Here I am in front of the Peabody Museum of Archeology and Ethnology where the reception took place. You can watch my lecture by clicking on the link – see right. 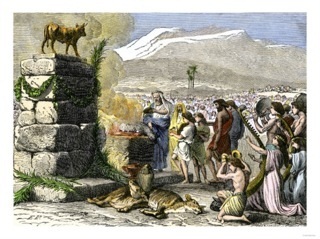 An imagined scene of a Homo erectus barbecue circa 1.8 million BCE. Here I am with Dr. Richard Wrangham, whose revolutionary book Catching Fire makes the case that barbecue helped make us human. 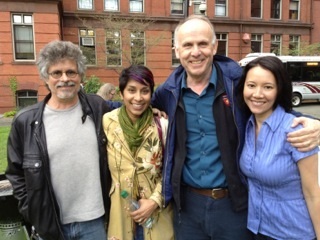 Between us is Harvard Evolutionary Biology lecturer Zarin Machanda, and on the right, doctoral student Rachel Carmody.